How i'm feeling: Still so overjoyed and happy to have this little one growing in my tummy! And feeling much better. I feel like a new person now that the morning (all day) sickness has made it's exit. Total Weight Gain/loss: I haven't checked in a week, but it was about 2-3 pounds. Movement: yes... it's absolutely amazing. I love feeling her move and hiccup. Sleep: It's hit or miss. I usually wake up 3-4 times a night. I figure this is just preparation for when she arrives. What I miss: Taking hot baths, sushi, and guinness... but all worth it. Cravings: still no big cravings. I am just happy food sounds good again! Symptoms: My uterus is growing and stretching and I never realized or thought that it would hurt. I get cramps and some discomfort, but I have read and talked to other mamas that say it is completely normal. Best moment this week: Picking out the paint, crib, curtains, and dresser for her nursery... we are so excited and have our old office completely cleaned out and ready to start filling. These moments we have had picking everything out together have been so much fun. But my favorite moments have been the excitement TL has when he touches my belly. Looking forward to: Her big 20 week ultrasound is this week. I can't wait to see her again and learn more about how she is growing and developing. I can't believe we are half way there! You look amazing! So happy for the two of you! I cant not wait to see what you have picked out for the nursery. 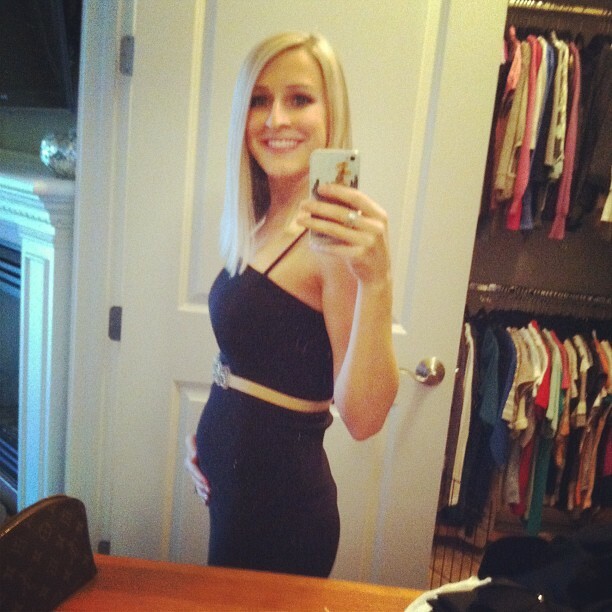 Such a little baby bump - you look great!!! cutest pregnant person alive! you look great! You look absolutely stunning! Love your hair and dress! Totally beaming! So excited to hear and see more of the nursery!! you look adorable! love reading these updates - glad to hear the all-day-sickness has gone away now! Wow, you are so tiny! Such a cute little bump :) Can't believe you're already 1/2 way... time is flying! Half way already? So exciting. I remember those cramps and discomfort; they're never any fun. PS: good luck on the GIVEAWAY! check back friday for the winner! You look so cute! :) I'm so glad that everything is going so smoothly for you! You look so beautiful - pregnancy definitely agrees with you, girl! You are beyond cute though with missing sushi and Guinness - my man would love you, I don't think he could part with Guinness if I paid him. So happy for you - which is going to be restated constantly! Congrats on your half way mark! You seriously are the cutest! You look fantastic! I'm 26 weeks and in all maternity bottoms - it truly is exciting! Glad you're feeling better. Wow you look amazing and TINY! You look fantastic Tracy!! Glad you are doing well and halfway where!!! Woohoo! Yay for 1/2 way there! You look adorable! You look fab and are so tiny!! Go girl! your hair is getting so long!! You are glowing, you beautiful Mama, you! mwah! Why do you miss taking hot baths? Are pregnant women not allowed to or something?? LOL Just curious! You look great! So tiny :) Thank goodness the all day sickness is gone, no fun at all!! You are looking fabulous my friend!!! Congrats on your little girl! The half way point is exciting - and the 20 week scan is a pretty awesome one, they go into a lot of detail so you get a really good peek :) New follower here, looking forward to reading more! Ohmygosh you are soo tiny! You look amazing! Hope you are feeling well! Does it bother you when people comment on your size? I'll play it safe and say- I think you are gorgeous and I love your dress! :) I'm so happy for you!